New York City is the home to many steakhouses, all of which claim to be the best in the city. The truth is, they aren’t exactly lying as there are several outstanding steakhouses in the city. I’ve tried many and for my money the one that stands out from the crowd is Midtown staple, Frankie and Johnnie’s. There are two location’s, fairly close together, one on W. 37th street and one on W. 45th street. Both are excellent but for the past five or so years the W. 37th street location has served as the gathering place for many birthday’s, bachelor parties, and good old fashioned guys nights out for my friends and I. According to the restaurant’s website, “Frankie and Johnnie’s Steakhouse began as a speakeasy in New York City in 1926. Legend has it that to gain access to the original speakeasy patrons knocked on the unmarked door and used the password “Frankie” when a small peephole opened. If it was business as usual, a confirmation reply of “Johnnie” was heard and admittance was gained. Hence, the Frankie & Johnnie moniker. Following the repeal of prohibition the restaurant became a steakhouse and an institution famous for steaks and chops.” I can just imagine the times that were had at Frankie & Johnnie’s, New York City, right in the midst of prohibition, the Roaring Twenties, it must have been amazing and it gives the legendary steakhouse a hell of a backstory. The location on W. 37th street is the former two story townhouse of John Barrymore and was designed with his study in mind. 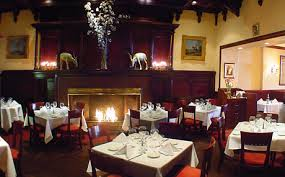 The dark mahogany walls, fireplace, and overall wonderfully appointed dining room make it warm and inviting. As soon as you walk in you are greeted by a cordial hostess who will show you and your party to the dining room though you are more than welcome to start with a drink at the bar, something I usually take advantage of as each of the friendly bartenders make a killer Grey Goose Martini. Once you do head up to the dining room and are seated, you’re waiter introduces himself. Where they found their wait staff I don’t know but they are truly an all-star crew. Besides being the classiest wait staff I have ever encountered, they are congenial, polite, and very attentive without being overbearing. If you decide to start with drinks, they have a huge selection of wines by the glass. If you’re a wine connoisseur, you won’t be disappointed with selections like Joseph Phelps Insignia Proprietary ’99 Napa CA, Dominus Estate Cabernet Sauvignon ’03 Napa CA, Kenwood “Artist Series” Cabernet Sauvignon ’97 Sonoma CA, Viader Cabernet Sauvignon ’02 Napa CA, and that’s just to name a few. If you’re celebrating an occasion Frankie and Johnnie’s has a very good champagne selection including Roederer “Cristal” 1999, Perrier Jouet ‘Fleur de Champagne’ 1999 Rose, and Perrier Jouet “Fleur de Champagne” Brut 1999, to name a few. As far as the menu goes, Frankie and Johnnie’s can do no wrong as far as I’m concerned. The appetizers are delicious from the Tuna Tartare to the absolutely delectable crab cakes, so fresh you can tell that they were just made minutes prior to arriving at the table. The raw bar is also exquisite, with the Little Neck Clams and very high grade shrimp cocktail as the standouts. One item I can’t rave about enough, and that I start every meal here with, is the Lobster Bisque. The consistency is perfection and the lobster chunks in the bisque are choice, truly errorless. For those looking for a pasta dish, though I’m not sure why you would be, the Lobster Ravioli is divine in a light Vodka sauce, the raviolis same day fresh. The lamb, pork, and veal chops are all perfect cuts and cooked to absolute flawlessness. The four USDA Prime Dry aged Cuts are Sirloin, Rib Eye, T-Bone, and a Porterhouse for two or three. The cuts are of the absolute highest quality and the chefs ensure that every steak sent out is cooked to the diner’s exact specifications. My personal favorite is the 12 oz. Filet Mignon. You can also get an 8 oz. but really, why? If you are planning to visit for the first time then the perfectly creamy garlic mashed potatoes are incredible as is the creamed spinach. I tend to eat my filet as is but the peppercorn sauce is so delicious that I at least have to use it for a bite or two. You might want to do the same. All in all, you will not find a better dining experience in New York City from the wildly talented wait staff, to the flawless food, and excellent ambiance.